This is amazing. 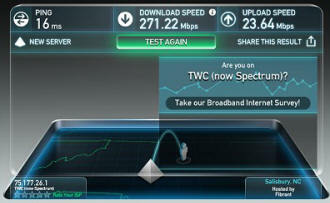 Yesterday, I ran the Ookla Internet Speed Test a couple times just to make sure the measurement wasn't a fluke. This morning I ran it again with the same incredible results - download speeds north of 250 Mbps and upload speeds of 20+ Mbps! Web pages load seemingly instantly - even with advertisements - and when I publish an RF Cafe webpage, it uploads as quickly as if I was saving the file to my local hard drive. Internet Nirvana has been reached. Online Shangri-La is here in Greensboro compliments of Time Warner Cable. Who would have thought? Looking at the Akamai Q4 2015 global average peak connection speeds rankings chart on Wikipedia, even the world leaders in Internet connection speeds like Singapore, Hong Kong, and South Korea pale in comparison to what they get here in Greensboro. 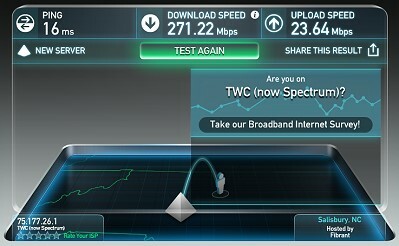 It's too bad that back home in Erie, Pennsylvania, the best TWC can do is about 15 Mbps download and 3-4 Mbps upload. The connection speed difference between Greensboro (we are visiting our kids, who live in Greensboro, NC) and Erie is almost like comparing dial-up to broadband. It's not like we live out in the boondocks where only a telephone line is available. We live just 3 miles from the Erie city line and are less than a mile from the Erie International Airport, and yes, we do have a cable connection (not DSL). You might try running the Ookla Internet Speed Test from your location to see how your ISP is performing. Hopefully, you're doing better than I am.